Bob was born March 9, 1938 in Cincinnati; the first of two boys born to Lawrence Andrew “Lefty” and Pauline E. (Moores) Mondary. After high school, while the Communist insurgency was beginning in Vietnam, Bob enlisted in the United State Navy..
After military service, Bob joined the Hamilton County Sheriff’s Office on May 23, 1968. He was so well liked and trusted that within 5 years, he was voted in as Vice President of the Hamilton County Sheriff’s Patrol chapter of the Ohio Civil Service Association; along with Deputies Ramon Hoffbauer and James Datillo. He was promoted to Sergeant 3 months later on June 18, 1973. During 1977, a 4-year-old with leg braces, Kenneth Wilkinson, fell into a cistern in Symmes Township and drowned. Deputy Mondary was the first responder on the scene, gave him mouth-to-mouth resuscitation and brought him back to life. Wilkinson was a Freshman at Goshen High School by 1989. By August 1979, his wife, Ruby Mondary, was serving as President of the Family and Friends of Hamilton County Deputy Sheriffs organization, a group of deputies’ wives, and was lamenting to the Hamilton County Board of Commissioners that their husbands were working too much overtime to overcome personnel shortages. She did not survive to see her husband die from a heart attack while exhausted and working overtime. By 1989, Sergeant Mondary was assigned to District 1 as the Sheriff’s liaison Miami Township Board of Trustees and West County Special Deputy Unit. He was looking forward to serving on the Sheriff’s Marine Patrol during the upcoming summer. During May 1989, rains caused the Great Miami River to rise to 23 feet. On May 26th, a temporary bridge across the river at Miamitown on Harrison Avenue (U.S. 52) collapsed, reportedly taking with it up to three occupied vehicles. For several days, Hamilton County Sheriff Deputies and Hamilton County Police Association Underwater Search and Recovery, during unseasonably hot weather, conducted an intense search. On May 30th they found and pulled one body from the river. By the end of the month, they were “plagued by exhaustion, sunburn, and equipment failure,” according to Cincinnati Enquirer reports. On June 1, 1989, at 3:30 p.m., working overtime and not feeling well, Sergeant Mondary supervised operations at the search site. He suffered a heart attack and collapsed. Emergency medical personnel called for AirCare to respond and carried him to the Whitewater Township Firehouse No. 105. Sergeant Mondary died before the helicopter arrived, but he was flown to University Hospital and pronounced dead at 4:43 p.m. by Dr. Cunningham. Sergeant Mondary was predeceased by his wife, Ruby Ann (Beasley) Mondary (1982) and his mother, Pauline Mondary (1979). He was survived by his father, Lawrence Mondary; children, Joy Mondary (30), Julie Mondary (22), Robert Mondary, Jr. (19), Lawrence Mondary (17), and Jonathon Mondary (13); a grandchild; and brother, Cincinnati Police Officer John Mondary. Visitation was held at B.J. Meyer and Sons Funeral Home, 4841 Glenway Avenue. A Mass of Christian Burial was celebrated at St. Theresa of Avila Church on June 5, 1989 and he was buried in St. Joseph New Cemetery. 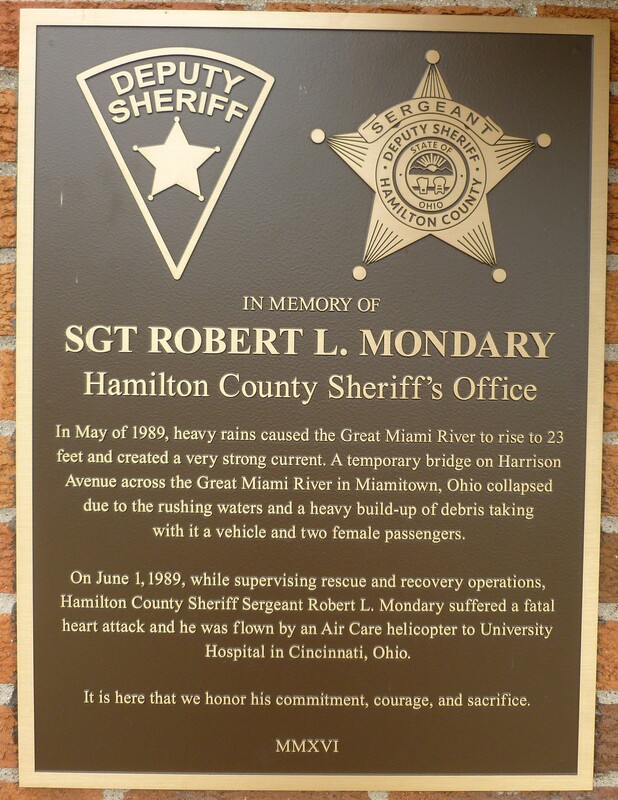 Twenty-six years later, Hamilton County Colonel Ramon Hoffbauer (Retired) led an ad hoc committee to find funding for a plaque to be commissioned in Sergeant Mondary’s honor. They were successful and the resulting plaque was dedicated and unveiled June 1, 2016, the 27th Anniversary of his death, at the Whitewater Township Firehouse where he died. It is mounted on the front of the firehouse. If you have further information, artifacts, archives, or images of this officer, please contact the Greater Cincinnati Police Museum at memorial@police-museum.org. (c) This narrative was revised June 1, 2016 by Cincinnati Police Lieutenant Stephen R. Kramer (Retired), Greater Cincinnati Police Museum Director. 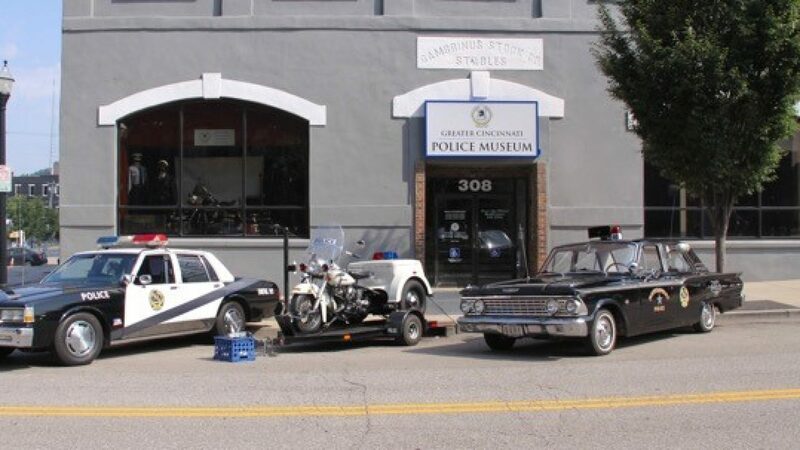 All rights are reserved to him and the Greater Cincinnati Police Museum.